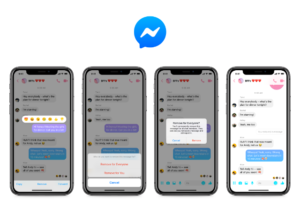 Facebook rolls out an ‘unsend’ feature in Messenger, which allows users to delete messages within 10 minutes after sending them. Now, there’s no need to worry about having to explain yourself when you send the wrong message to the wrong person or when you mistyped something. The new feature is available for all types of messages on Messenger–personal or group threads alike. To use this feature, simply tap on the message you want delete, and then select the “Remove for Everyone” feature. After that, Messenger will then alert everyone in the conversation that a message has been removed. You only have a 10-minute window to ‘unsend’ the message after you’ve sent it. Messenger also gives you an option to removes messages just for yourself. Following the same steps, tap on the message you want to delete. Select “Remove for You” and the message will disappear from your end. However, the rest of the users in the chat will still see the deleted messages on their end. The remove message feature will come to Messenger users around the world. Make sure to install the latest versions of the app on iOS and Android to get the feature.